I was an ABV (açaí bowl virgin) until just a few days ago during my last morning in Kailua-Kona, Hawai’i. 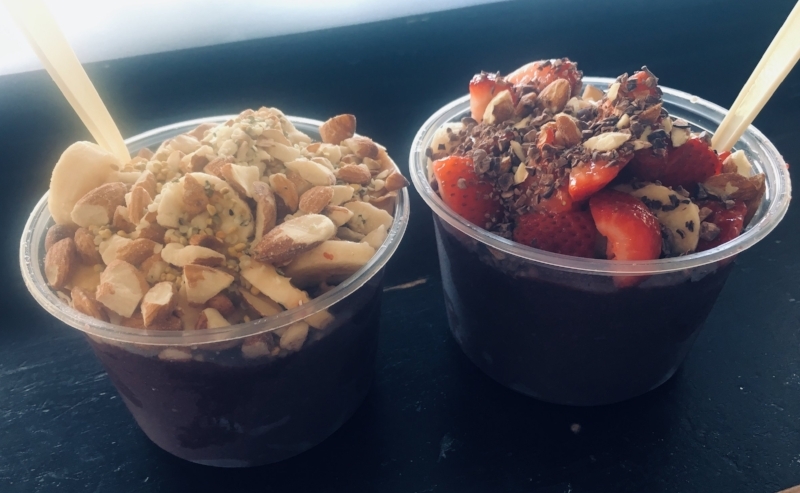 I was there to support some athletes for the Ironman World Championships and while not my first time there, I had never tried an AB (açaí bowl) before. If you aren’t familiar with the AB, it’s basically heaven in a bowl. To be more specific, it is typically a puree of açaí berries with other fruit and milk (or juice) of choice that serves as the base of the bowl, topped with several goodies such as granola, seeds, nuts, nut butter, more fruit, cacao, honey, and coconut. Açaí berries are most known for their potent antioxidant and phytonutrient content. While there may be positive health benefits from including açaí in one’s nutrition patterns, it isn’t a magical superfood that will cure all ailments and disease. And don’t fall for the Açaí Berry Miracle Diet either. The AB has been around for several decades, originating in the Amazon area and then becoming popularized in Hawai’i and the southern California region. Nowadays, you can find ABs in major cities in health clubs, specialty food stores and markets, juice bars, and smoothie shops. Of course, you can make your own too. Did I mention the AB is heaven in a bowl? Yes, however… the potential “nutritional trouble” with ABs is that they can easily contain excessive calories and very little protein and fat. ABs can pack well over 75 grams of carbohydrate/sugar, an amount that can be over or close to one’s daily limit for those who are following controlled-carbohydrate eating plans. It’s a bit like commercially prepared smoothies - although they contain whole fruit as a base, the additional ingredients and portion size can translate the seemingly healthful meal into more of a dessert. I’m not sure what the norm is for portion sizes of ABs at most shops on the mainland, but BasikAcai is not shy with their offerings. Seriously, the small size was huge. This picture doesn’t do justice to what I’m saying, but it’s basically a pint size overflowing. Thank you to BasikAçaí for the larger than life bowl. I had the Banyan (shown on the left). We skipped the honey - it really isn’t necessary with all of the sweetness from the various fruits. And it was still super sweet tasting! So, I’m not saying ABs are “bad for you” solely due to the calorie and high carbohydrate content. We have to put everything in a personal perspective and context when we talk about a food (and experience) like this. For me, I could not include the classic ABs regularly in my daily nutrition because 1) I would overeat on my daily energy needs (these are very palatable to my brain and not easy to “just eat half”) 2) I didn’t stay as full as I thought (likely due to low protein content), which relates to #1 in that I ate again within a couple hours. However, I was more than happy to give the AB a try simply because it was a new food for me and I knew I was in a spot for good quality bowls. Plus, how fun is it to share in fun food with our friends when traveling?! Most definitely, I will be experimenting with some homemade versions. Stay tuned for some recipe ideas! Older PostDIY Pumpkin Yogurt with a Toast!